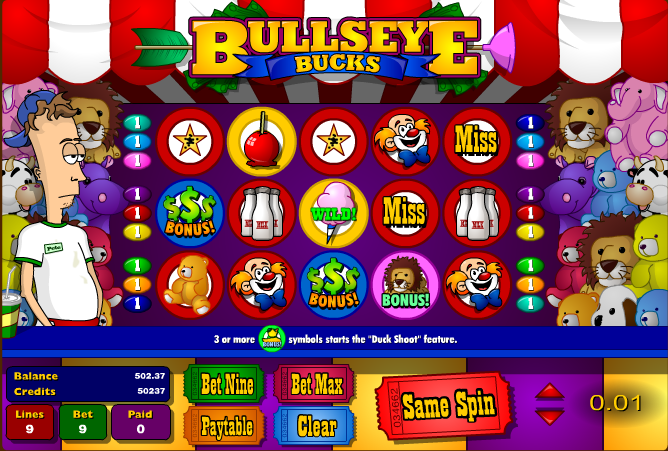 Bullseye Bucks is an online slot from Amaya Gaming which is a reminder of the days when the fairground came to town. If you were too wise or too scared to risk any of the dodgy-looking rides you could take a stroll around the stalls and find one which didn’t look like too much of a rip off. This slot is all about one of those fairground attractions – the one in which you fire pellets at metal targets with no hope of winning. Bullseye Bucks is a five reel and nine payline game which recreates that shooting range, complete with unwinnable soft toy prizes and a sullen youth called Pete watching over proceedings. The symbols are all blank targets when you press the ‘Same Spin’ button and rather than the reels spinning, they flip over from left to right to reveal the symbol. Basic ones include a ‘Miss’, a star, a teddy bear, bottles, a clown, a toffee apple and a hot dog. The wild symbol is candy floss and players should note that it only substitutes for hot dogs and toffee apples to help you win. There are three bonus symbol – dollars, a stuffed lion and a plastic duck – which each have their own bonus game. This is triggered by landing three of more of the dollar symbols on adjacent reels; it’s payday and Pete’s boss is handing out his cash. All you have to do is watch the money roll in until his generosity runs out. If you’re lucky he may even give Pete some overtime. If you can trigger this feature with four or five symbols the prize will attract a 2x or 3x multiplier. Trigger this by landing three or more of the stuffed lion symbols on adjacent reels. You will be shown a screen displaying a number of prizes and you must pick them to reveal rewards. If you can pick four without finding the ‘Out Of Stock’ message you will move to the next stage where the prizes are more valuable. There are three possible stages. If you can trigger this feature with four or five symbols the prize will attract a 2x or 3x multiplier. If you can find the ‘Jumbo’ prize on the first pick you will win the maximum 20x multiplier. If you can trigger this feature with four or five symbols the prize will attract a 2x or 3x multiplier. Finding ‘Sharpshooter’ on the first shot will get you the maximum 20x multiplier. The paylines are fixed so there’s not much we can offer in they way of strategic advice but it is worth keeping the sound on for the full fairground experience. 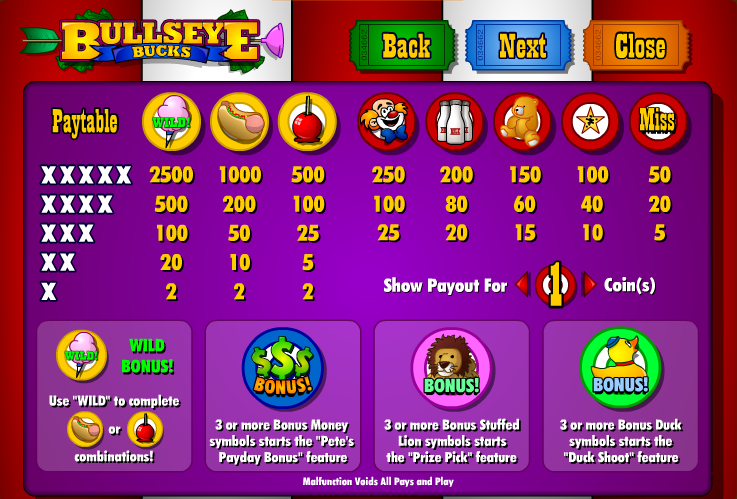 Bullseye Bucks is certainly basic but it’s quite good fun and doesn’t take itself too seriously. There’s plenty of bonus action available for lucky players.